Most of our units have over-sized doors for easy access. There is an alarm system and cameras to insure a secure storage area. These is an on-site manager to help you with any needs that you have. The storage units range from 5x10 to 12X30. The property is fully fenced with security gate access. The following size guide is offered to help you estimate the size storage unit that best suits your needs. In addition to the sizes below, our Locations provides a variety of different size units. 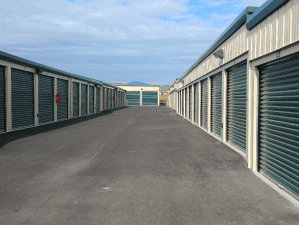 Our friendly storage managers will provide further assistance for your specific needs. Our 11 foot wide doors are easy to drive into! Plan before you start. Put the items you need to access frequently at the front of the unit. Prepare a map of your unit so you know where you have stored things. A simple drawing will come in handy later. to the ceiling. Place heavy items at the bottom and stack lighter items on top. Use boxes so you can stack your items easily. Use a step ladder so you can stack items above your head. Stack chairs seat-to-seat with towels or blankets between them. Break down your furniture by removing any legs so you can optimize your space. Use your refrigerator to store things inside. Be sure to leave the door open slightly so air will circulate. Otherwise, mold can form inside. Leave a little space between your items and the walls, so air can circulate. Also, leave an area where you can walk to the back of your unit so you can access items later. Place tools in an empty garbage can and stack cans together. Remove all fuel from lawn mowers or other gas powered equipment to reduce odors. Although the decision of moving your home can be exciting, packing is something most of us dread. By using our guide, you will feel more secure in knowing that your possessions will get to your new address in one piece. Once you're there, you'll be able to find everything when the time comes to unpack and get settled. Here are several handy tips to help you get started. what you will be moving to your new address. 3. It's also wise to make a note of the serial numbers on your electronic equipment. Bubble Wrap, Newspaper, Wrapping Paper, and Tissue Paper. Wrap all your breakable items in bubble wrap, wrapping paper, or tissue paper. Ziploc bags can be used for small odds and ends that usually clutter your drawers. It always makes good sense to begin packing well ahead of the move. We strongly recommend that you use good quality, strong moving boxes, and always be certain that the bottoms are fully secured. Don't get overwhelmed. Try to concentrate on one room at a time. Be sure that every box is clearly labeled by room and item. Once your moving boxes are filled, they should be placed in an area close to your front door. Important items (such as photographs, wills, jewelry, home videos, and any other important documents) should be packed separately so that you can personally carry them with you on moving day. Another alternative you might want to consider is placing these belongings in a safety deposit box until after the move. Fragile items should be packed loosely with plenty of wrapping. The boxes must be clearly labeled "FRAGILE", and finally you will want to stack them towards the top of your piles. Non-breakable items should be packed snugly in smaller boxes. You will want to make sure that they are not too heavy, and that they are at a weight you feel comfortable carrying. Don't forget to pack your books flat, alternating the bindings so they will stack evenly. When possible, small appliances and electronic equipment should be packed in the boxes they came in, and then taped securely. In order to avoid unnecessary ironing later on, make sure you have enough wardrobe boxes. When disassembling your bed, use tape or rope to bind the frames together. Your drawers should be filled with wrapped items or clothes. Entire drawers should be covered with a blanket or old linens. You shouldn't tape the drawers shut - the finish on your drawers may be damaged. Cover your tables with a blanket or old linen. When possible, remove the legs. Always wrap the nuts and bolts in a plastic bag and secure them to a leg. Check your owner's manual for any special moving instructions of appliances and other electronic equipment. In order to keep the tub of your washing machine from moving around during the move, fill it with stuffed toys, blankets, towels, and old linens. Make sure that all loose parts in your refrigerator(including ice containers and drawers) are secure. Any exposed coils should be padded to protect them during the move as well. Bicycle handlebars should be loosened and turned sideways. Don't forget to keep the chains and pedals covered, otherwise grease and oil might rub off on other items. Small mirrors should be carefully wrapped and packed in boxes. Cardboard should be used to cover large paintings, artwork, or wall mirrors. When possible, these items will be kept safe in wardrobe boxes. Because your outdoor furniture may be too bulky or heavy to move in one piece, you may need to disassemble it. If so, be sure to place the nuts and bolts in a plastic bag and attach it to the furniture. Carpets and rugs should be rolled up and carefully secured with tape or rope. Wrapping sharp edges on any tools or attachments will help prevent injury. Power tools should be packed with plenty of cushioning. Be sure to tie or tape your tool chests securely closed. A very important reminder is to carefully dispose of the gasoline and oil from your lawn mower and other machinery, as well as any flammable or poisonous household products. Remember not to pack rags that are soiled with fuel. They should be properly disposed of to avoid spontaneous combustion. Our rates are very competitive. We offer “Specials” that make our rates extremely attractive. We don’t require a security deposit. We do have a $10.00 administration fee that can be waived if you sign up for automatic payment on your credit card. We encourage everyone to stop by and take a tour with our friendly and knowledgeable manager. We will analyze your specific storage needs. We offer a fenced and gated property, an on-site manager, 24-hour access (upon request) and more. Please inquire directly for pricing and current specials. What size units do you have and what size do I need? Our friendly manager has years of experience and can help you determine what size you need based on what you are storing. Use our “sizing guide” as a reference. We have small units (5'X10') to large garage sizes (12'X30'). We provide you with one heavy-duty Chateau disk lock when you rent a unit (limit one per customer). We sell additional locks for $14.95, along with a complete range of packing supplies that include boxes, tape, mattress bags, plastic bubble wrap, etc. All of our packing supplies are value-priced. Our contracts are month-to-month and you can move in or out as you desire. There are no long-term contracts. If you do need long-term storage, check with our manager for specials offered at the time of rental. When do I have access to my unit? Our standard access hours are from 6 a.m. until 10 p.m. 7 days a week, even on holidays. We can provide 24-hour access to businesses that need it, upon request. Our office hours are Monday 9am -3pm. Tuesday through Saturday 9am-6pm and closed Sunday. Our manager has a number that you can call after hours in case of an emergency. Our manager lives on-site, so someone is on the property most of the time both day and night. The gated access allows only those with an access code to enter. You will have your own special access code (which you will select) so you will be able to enter the access gate. We have 20 video cameras throughout the property that provide surveillance. Our gate software keeps track to everyone who enters and leaves the property, so we always know who has been coming and going. Our site is fully fenced and well lit. We have insurance available at a very reasonable rate through our affiliate. Your manager will assist you with this when you rent your unit. Some homeowner policies cover self storage, but most do not. You might want to check with your insurance company first to see if you’re covered. We accept checks, money orders, Visa, Master Card, American Express and Discover. We can set up an automatic payment on your credit card or debit card, which will waive your $10.00 administration fee. We have a drop slot near our office door for after hour payments. Please do not deposit cash into the drop slot. Yes, we have a wide variety of boxes in several sizes along with other packing supplies such as mattress covers, tape, utility knives, magnet lights, rope, gloves, batteries and much more, all at discounted prices, in the office. Do you have any specials for military, students or seniors? Yes. We offer specials for all of the above. Please check with our manager for details. Do you have a referral program? YES! If you are an existing tenant who refers a customer to us who rents a unit, we will pay you $25.00 in cash! Ask your manager for specific information. What kinds of things cannot be stored in a unit? Hazardous and toxic materials are strictly prohibited. This includes petroleum products, acetone, etc. If you have any questions about certain items, please check with the manager. Do you have a moving trailer I can use? Yes. If you need a moving trailer, we have one available for your use if you will be spending a minimum of $150.00 on storage over the next few months. Please call for details, 208-773-7488.